When was the last time you wrote someone a letter, by hand, using pen and paper? I’ve recently been going through some old documents, and unearthed two specimens I had to share. 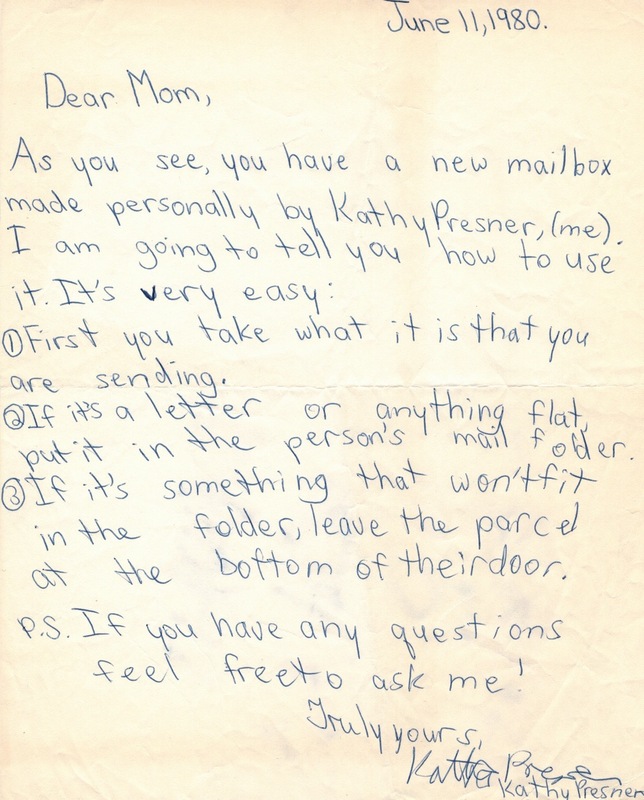 I had forgotten all about the incident when, as a 12 year-old, I was inspired to set up mailboxes outside my mother and brother’s rooms, as well as my own – for important inter-bedroom deliveries, I guess? I wish I could remember the details, because really, I can’t imagine what I was thinking. 1. First you take what it is that you are sending. 2. If it’s a letter or anything flat, put it in the person’s mail folder. 3. If it’s something that won’t fit in the folder, leave the parcel at the bottom of their door. p.s. If you have any questions, feel free to ask me! 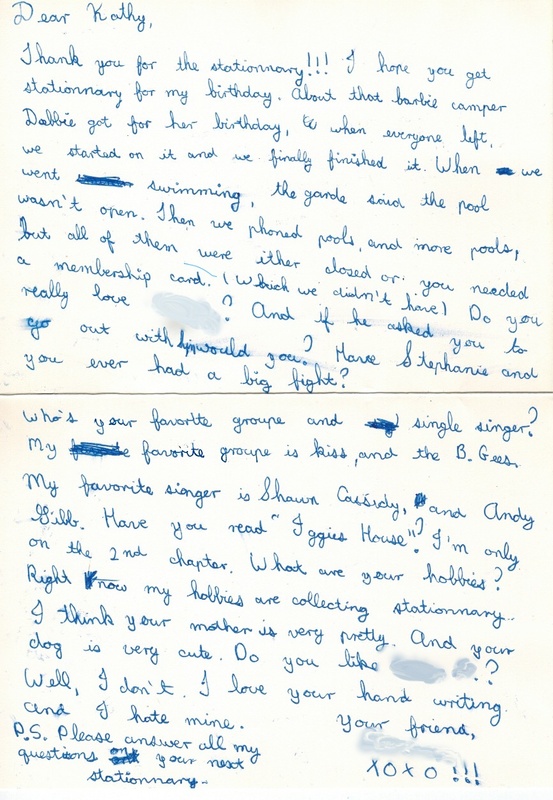 Here’s a letter – circa grade five, I’m guessing – from an era when we were obsessed with a limited set of things, including stationery (this letter was written on a frolicking-kitten-adorned notecard), who-liked-who, Shaun Cassidy, and each other’s handwriting. Thank you for the stationnary!!! I hope you get stationnary for my birthday. About that barbie camper Debbie got for her birthday, when everyone left, we started on it and we finally finished it. When we went swimming, the garde said the pool wasn’t open. Then we phoned pools, and more pools, but all of them were either closed or you needed a membership card. (Which we didn’t have. Do you really love [boy’s name]? And if he asked you to go out with him would you? Have Stephanie and you ever had a big fight? Who’s your favorite groupe and single singer? My favorite groupe is kiss, and the B. Gees. My favorite singer is Shawn Cassidy, and Andy Gibb. Have you read “Iggie’s House?” I’m only on the 2nd chapter. What are your hobbies? Right now my hobbies are collecting stationnary. I think your mother is very pretty. And your dog is very cute. Do you like [another boy’s name]? Well, I don’t. I love your hand writing. And I hate mine. I tend to walk through the city with my guard up. Wearing my city armour. When people approach, I make an instantaneous assessment – what do they want? Money? A cigarette? Do I slow my pace? Look away? Meet their gaze and shake my head? “Sorry, I don’t smoke.” Smile briefly, tight-lipped, try to acknowledge their humanity, but not encourage further communication? The tourists are usually easy to spot – they often clutch a map, guidebook, or these days, a phone – and have that wide-eyed look. Sometimes I address them before they ask. “Do you need any help?” I guide them to the nearest metro stop, grocery store, bagel shop. This night isn’t like any of those. “Would you like me to walk with you for a bit in that direction? I’d be glad to,” I offer. There’s no sidewalk dip, but he says he can make it up. He tries to push his chair over the lip of the sidewalk, but it isn’t easily going over. “I should be able to do it,” he says. “Can I do anything?” I say. I take the leash and hold the wagging German Shepherd while he maneuvers the step with the chair. The chair finally makes it onto the sidewalk. We walk and roll along the dark side street. There’s a short awkward silence before I make some small talk about the weather. “That’s a very interesting wheelchair you have, I don’t think I’ve seen one like that,” I say, pointing to the smaller front wheel. Patch trots quickly alongside his owner. “That’s my building! I recognize it.” A look of relief washes over his face. “Hopefully after a bit more time you’ll get used to the area,” I say. “Oh, I’m only going out by myself during the day from now on,” he says. Then we turn and go our separate ways. It took me a couple of weeks after the sad news of Anthony Bourdain’s death to remember that I’d met him once. After it hit me, the details started coming back slowly. He was in Montreal to do a Q&A for his latest book at the time, No Reservations: Around the World on an Empty Stomach. The event took place at the gorgeous old Corona Theatre in Little Burgundy, and I went with a foodie friend I’ve since lost touch with. Bourdain started the evening by recounting a misadventure he’d had on arrival at the airport, where the car that was sent to fetch him wasn’t properly licensed for airport pickups, and the driver got a ticket while he was in the back seat. From what I recall, he didn’t seem angry, rather just a little annoyed by the delay caused by our arcane permit regulations. While I don’t tend to fawn over celebrities and can be quite shy in these sorts of situations, I’d brought my copy of No Reservations and forced myself to stand in line for him to sign it, thinking that – as a huge fan of his work – I’d regret it later if I didn’t. When I got to the front of the line I empathized with his airport snafu. “That doesn’t sound like a nice welcome to Montreal,” I said. “Sorry about that.” (As a Canadian it was my duty to apologize, even though it wasn’t my fault.) He chatted with me a bit in a friendly, down-to-earth way, scrawled his name in my book, and that was that. Last month when I was at the cavernous Powell’s Books in Portland, Oregon, I roamed the food-writing section out of habit, looking at what was new. There was a gap where Bourdain’s books used to be. “All of Anthony Bourdain’s books are presently sold out,” the handwritten note read. “We miss Anthony Bourdain.” Indeed. I don’t often get out to author readings, but my friend Sarah had an extra ticket to see venerable Canadian Broadcasting Corporation host Eleanor Wachtel interview Michael Ondaatje (of The English Patient fame) for her long-running radio show Writers & Company. While I’d never read any of his work, Wachtel is a compelling interviewer no matter who’s in the hot seat, so I figured why not. I arrived early (as usual) and Sarah was running a bit late, so I scored great seats for us near the front and took out my phone to catch up on emails while killing time. An older woman asked if another seat next to me was available, and joined me at our table. As I age, my definition of “older woman” morphs upwards, but I would later find out she was in her late seventies. In that moment I realized exactly what I’d done. My brain’s unconscious bias had taken over, and I’d totally stereotyped her interests and knowledge, based on her age and gender. Over the last few years I’ve been more conscious of what’s in the products I put on my body and face. 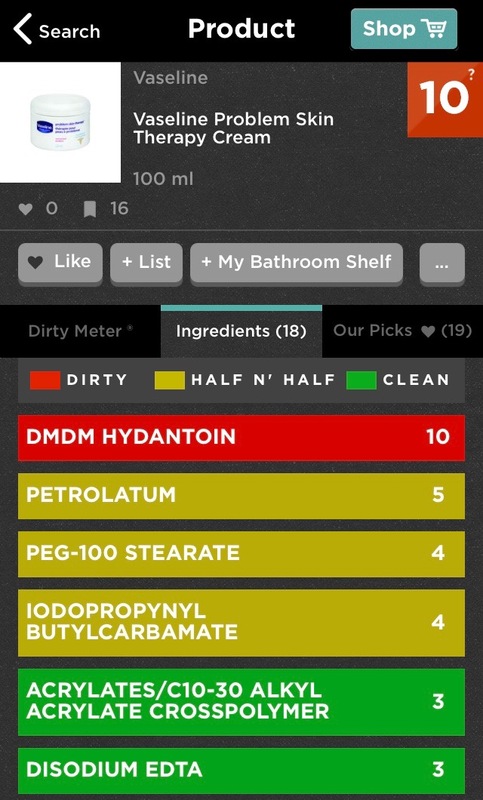 I recently started using an app called Think Dirty (tagline: Shop Clean) that’s made it easier to research the ingredients in cosmetics. Armed with this new tool, I set about looking for face powder and mascara (which I wear rarely anyway) and in the process, somehow managed to block out of my mind the fact that – especially with my dry skin and winter’s dry climate – I liberally use a certain mass-market moisturizer after every shower. With some trepidation, I looked it up in the app. A solid 10/10 on the toxicity scale. An ingredient called DMDM hydantoin – a “formaldehyde releaser preservative” was the worst culprit. Ooops. I began to search for a replacement moisturizer – something not too strongly scented, not too expensive, and easy to get in Canada. Apparently this was asking for a lot. After spending far too long looking for the elusive product, I started to peek more closely at the ingredients in the expensive, natural moisturizers I was finding in the app. Shea butter, “a fat extracted from the nut of the African shea tree,” according to Wikipedia, was in a lot of them. With that, my adventure in making body butter began. I found a recipe that looked doable and had good reviews. I ordered a kilo of unrefined shea butter (it was cheaper in bulk) and some sweet almond oil. I already had a jar of raw, virgin, coconut oil on hand. I researched essential oils and consulted my friend Victoria who knows a ton about this stuff, and talked with a clerk at my local natural-foods store. I settled on bergamot essential oil – who wouldn’t want to smell like a cup of Earl Grey tea, I thought? And on a Saturday morning, post blizzard, I got down to work: melting, whipping, jarring. Before I knew it, it was done. I guess time will tell how much I like my homemade body butter, but I certainly had fun making it. And now I have a hankering for some Earl Grey. Say what you want about Montréal’s flaws — and it certainly has many — I think we do a couple of things quite well: festivals and snow removal. 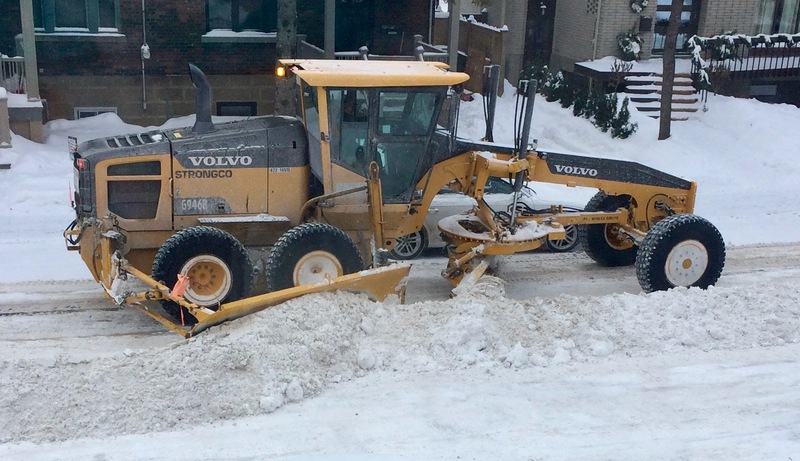 Now, some might argue we have too many festivals, while others are annoyed when the snow doesn’t get cleared fast enough, but when folks from other cities look at our city’s snow-removal process, they are usually quite impressed. Heck, after living here all my life, I’m still impressed at the whole process. 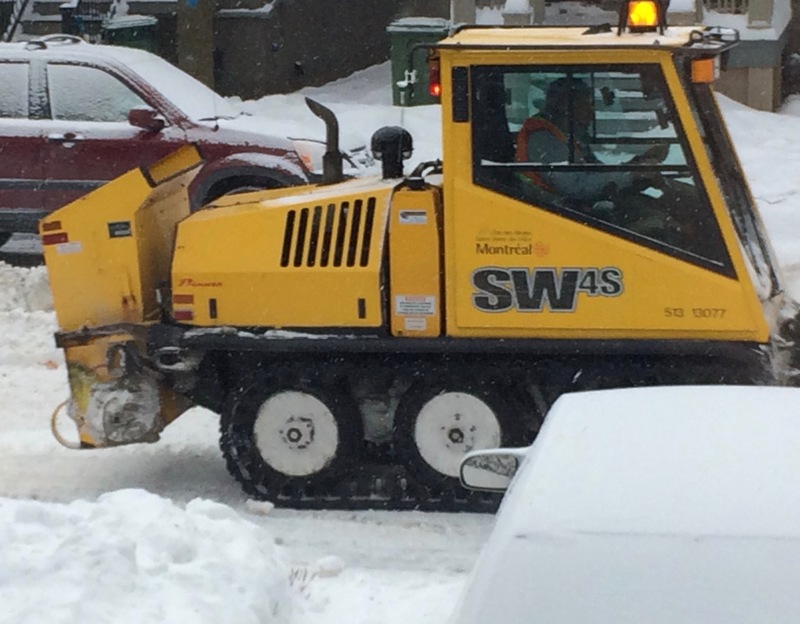 Streets are spread with abrasive/salt and plowed while the storm is happening, and once a minimum amount of snow has fallen — 2.5 cm or about an inch, in case you’re interested — the clearing operation begins, one side of a street at a time. When the special temporary orange no-parking signs go up after a snowstorm, I eagerly await the telltale sound of tow trucks coming around to tell drivers to move their cars out of the way of the incoming onslaught. (This part is definitely no fun if you don’t have a garage or a driveway.) An app, INFO-Neige (“Info Snow”), also helps us keep track of what streets are being cleared, when. If your car is parked on the street, you can enter its location in the app and get notifications to remind you to move it before the plows come by, to avoid getting towed. Little sidewalk plows come by and push the snow onto the street, where giant plows three or four times the size come by and scoop it all up, blowing the collected piles into massive trucks. Multiple convoys lumber across the city, like rows of ants on an unstoppable mission. But wait — there’s more! The plows often come by a second time, picking up any remaining small bits of snow that the first convoy didn’t grab. This round is particularly satisfying to watch, as the plows scrape the edge of the sidewalk, in attempt to have a thorough cleanup. The trucks take all the amassed snow and either dump it down sewer chutes, or unload it at various surface snow dumps around the city. The piles are so massive that if you happen to go by one in May or June, the snow still might not be melted! 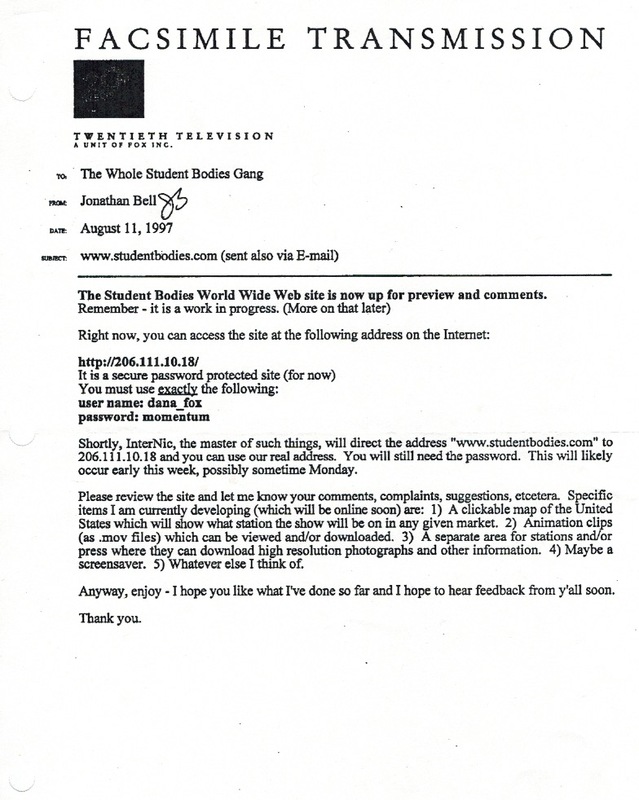 It has come to my attention that this year is the 20th anniversary of a TV show called Student Bodies. This makes me feel really old. You see, Student Bodies is one of the last projects I worked on back when I made my living in film & TV production. 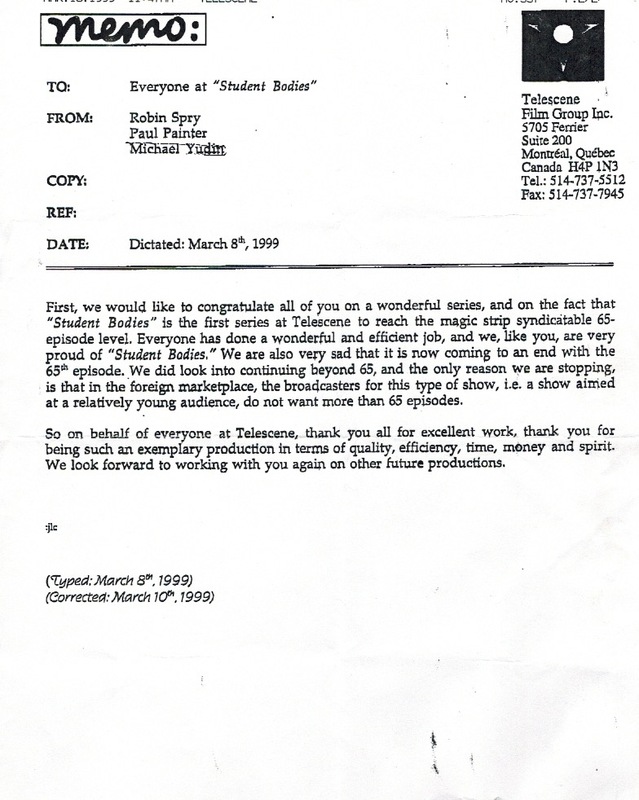 I served as production coordinator on its first season, a few years before I entered the tech world and left behind everything I hated about the entertainment business. Working on the show was… an interesting experience. I wasn’t bad at being a production coordinator — my detail-oriented brain was well suited to it — but I realized pretty quickly that I didn’t enjoy it. The role was stressful. I worked ridiculously long hours. There was always too much work, or someone demanding something of me. (For some reason, that didn’t stop me from being a production coordinator again on another show the following year — what was I thinking?) Thankfully, within a few years I made the permanent switch to Web-related work and never looked back. I never really watched the show, but apparently it has somewhat of a cult following of people who remember seeing it as a kid, which is kind of cool. Some of the cast will be reuniting at a convention in Toronto this fall. In a fit of nostalgia, I went back to take a dip in my files from that era. Being a bit of a packrat, there was lots to choose from. Here are just a few I’d like to share. Paperwork, mostly. Once a production coordinator, always a production coordinator, maybe. 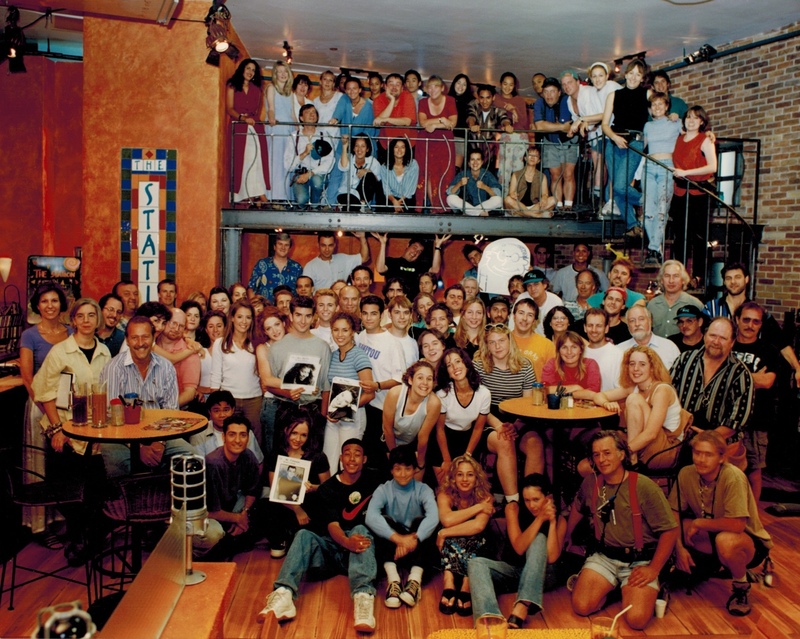 Cast & crew photo at The Station – the show’s student hangout spot. Can you find me? I’m not sure what bothers me more about this memo. 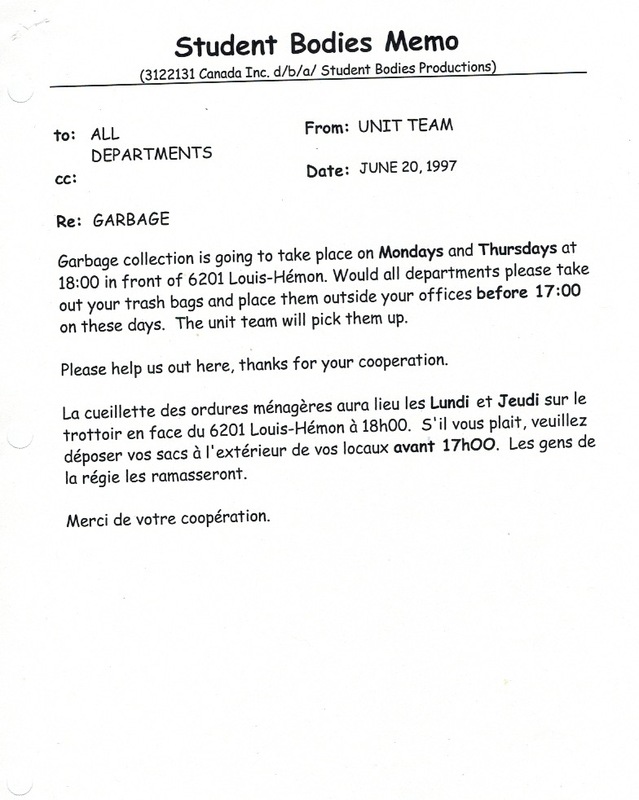 Its crookedness, the fact that we wastefully printed out thousands of pieces of paper, or THE FACT THAT’S ENTIRELY IN COMIC SANS, WTF? This was our official production font, apparently. It’s a fax – also sent via E-mail (sic). We’re going on the Interwebs! Note the username for the password-protected site. The late Robin Spry – one of the show’s producers – was such a class act. 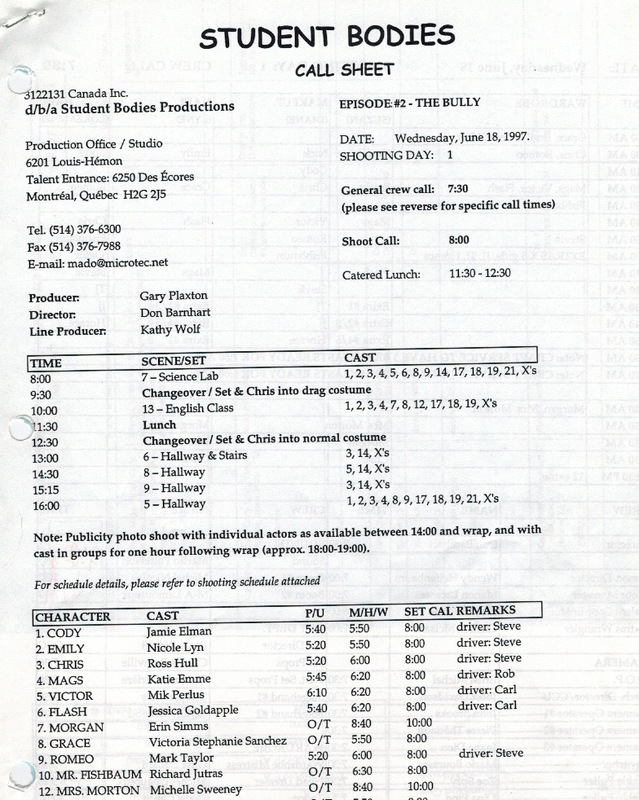 My first “call sheet”: shooting day 1. It was my job to put these together: a zillion small pieces of information to get exactly right, every day. We filmed at a real school.